It found that tax evaders cited a range of reasons for withholding tax. Of course there’s no way to know what percentage of people who evade tax or duty is represented in those figures, but it’s clear that it’s by no means a risk-free way to operate. On this, there are some concrete numbers. In 2009/10, there were only 12 ‘enforcement actions’ as HMRC calls them in this context, yielding £155,000 – but that soon ramped up. That’s an interesting pattern – more investigations in 2012/13, but producing a lower yield than in 2011/12 – perhaps because the risk of being investigated came to be perceived as higher and so individuals took more care to remain compliant. After 2014, though, information dries up because, as the Revenue explained in response to a freedom of information request in 2016, “by disclosing numbers of enquiries… HMRC is at risk of inadvertently providing people with the means of identifying coverage rates”. Quite apart from any penalties for failing to pay tax, and even if an investigation finds that your tax returns are complete and accurate after all, the process can be expensive, time consuming and stressful. The length of the investigation and the number of individual queries from inspectors is beyond your control, or that of your accountant. It is not uncommon for them to roll on for more than a year, and cost thousands of pounds. 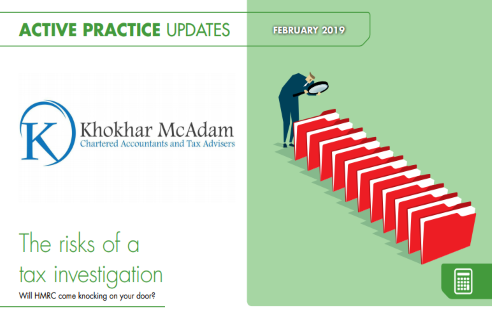 Tax investigation insurance packages are available to help cover the costs of unexpected and prolonged probes, and can help soften the blow. HMRC doesn’t publish a big list of behaviours it’s looking out for because, obviously, it doesn’t want to give would-be evaders ideas for disguising what they’re up to. It is generally acknowledged, though, that there are certain red flags. High variation in turnover or profit from year to year would be one example. Consistently paying little or no tax is another. In short, anything that seems out of the ordinary or out of step with the norm for your sector or region – ‘dodgy’ is the most common turn of phrase – will at the very least prompt further scrutiny. When it comes to spotting potential ‘dodginess’, HMRC is better equipped now than ever. Since 2010 it has used a powerful data analysis system called Connect to pull in and cross-reference vast amounts of information on taxpayers. Putting all that data together might, for example, highlight someone reporting minimal profit from a business in a generally profitable sector, while at the same time whizzing about in top-of-the-line sports cars. On the other hand, many investigations are the result of something distinctly less high-tech: tip-offs from disgruntled neighbours, friends, relatives or employees. In 2017/18 HMRC’s tax fraud hotline received 40,000 calls, and more than £340,000 was paid out in rewards to informants. One of the motivations for the rollout of the Making Tax Digital (MTD) programme is to make business accounts more transparent. MTD will make it compulsory for businesses to keep their accounts using software rather than on paper. The first stage of MTD, covering VAT, kicks in from 1 April 2019, and applies to businesses with a taxable turnover above the VAT-registration threshold of £85,000. Although there won’t be any requirement for businesses to submit details of every single transaction to HMRC on a real-time basis, they will be obliged to record them, and may be asked to hand over those more detailed records in the event of an investigation. There will also be an option down the line for businesses to voluntarily submit more detail. Will businesses look as if they have something to hide if they don’t do so? That is certainly a risk. If you’re worried the way you’ve handled your tax affairs in the past hasn’t been quite above board and you want to clear your conscience, the first thing to do is talk to someone. HMRC advise those who have failed to declare income, or to pay tax on it, to make full disclosure to them at the earliest opportunity. Depending on the size and complexity of your disclosure, however, talking to us as your accountant could considerably reduce the stress. We will help you work through the issue and pin down the numbers, and we can counsel you through potentially difficult conversations with HMRC.